Cleveland Browns head coach Rob Chudzinski against the Minnesota Vikings at Mall of America Field at H.H.H. Metrodome. The Browns defeated the Vikings 31-27. 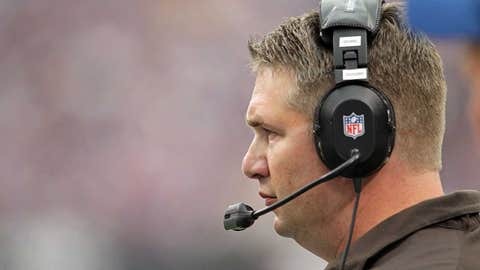 BEREA–After rumors started flying around about Rob Chudzinski’s future with the Browns, it became reality only hours after the Browns concluded a 4-12 season. The Browns issued a release after meeting with Chudzinski around 9 p.m. Sunday night. The release came from the organization without being attributed to any one individual. The most notable line in the release was that "When we believed we were not positioned to achieve significant progress in 2014, we knew we had to admit that a change was needed, and move forward." Chudzinski completed his third different stint with the Browns. He was on Butch Davis’ staff and then offensive coordinator under Romeo Crennel before becoming the head coach last January. Ironically, Crennel was fired after losing to the Steelers in the season finale of the 2008 season after finishing 4-12. It is not known if either Norv Turner or Ray Horton will be retained or considered for the vacant position, nor if the rest of the staffs will be retained. Several NFL coaches are expected to be fired, but the Browns were the first to make a move after the season finished. The Browns have announced a press conference for Monday at 12:30 pm concerning the move.